peggy wong . on bluepoolroad: bluepoolroad opens today! 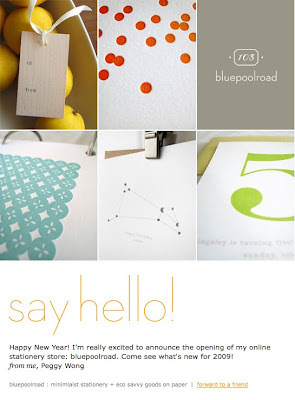 my very first newsletter announcing the opening of bluepoolroad. stay tuned for more to come. happy 2009! Congrats on your opening! I had to take a closer look after seeing your work on the Design Sponge blog. Beautiful work-best of luck to you! Just saw your shop on Design Sponge and came right over, it is beautiful! Congratulations on your grand opening. Beautiful site! I love your recent posting and you have motivated me to get moving and post to my site.